Push button tags in a black/silver or red/silver in an assortment of sizes are available. Contact us for dimensions available and pricing. Stainless steel plates are available in a large variety of sizes and grades. The grade we use the most is 304 for engraving or lasering. 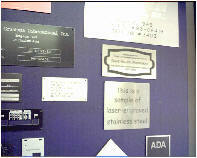 Stainless can be marked in two ways; engraved or lasered. Engraved letters can be shallow and engraved with the diamond drag method, in which case the letters remain silver, or routed deeper and paint filled. Lasered stainless steel will give you great, long-lasting results, with a silver background and dark charcoal colored letters. The darkened letters are not paint filled, and will not wear off. Stainless steel is perfect for indoor or outdoor applications under heavy use. Provide us with your copy/designs and other pertinent information and we'll prepare a quote for your project. We can also provide YAG lasering on production runs. The product in the back shown in the photo above is YAG lasered. The lettering can be incredibly small and still very legible. 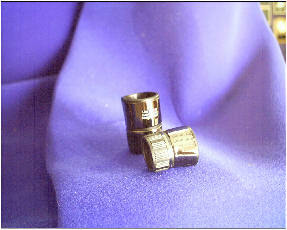 The product in the photo above is made of thin titanium - you would get a very similar look on stainless steel. If you are searching for other application materials, we can provide you with photo-etched, silkscreened, etched, sublimated, thermal and many other processes. Give us a call and we can discuss where your tags or panels will be placed, what kind of environment they will be up against and make recommendations for the best product for your project. Our shop also creates many different engraved plastic industrial tags, in a wide range of sizes and shapes. We provide our clients with simple tags for electrical panels, airplane replacement panels, directional and emergency signage in languages other than English, and many other products. Our clients know they can bring us their requirements and we'll create the layout and make a recommendation for the best product to meet their needs.